Four boats set out this morning for Team Lanier’s 2018 Tugaloo River Hybrid Run on a pristine morning with no wind, fog or rain in the weather forecast. After meeting at Oakwood Bait & Tackle to get our bait we were all to converge at the Rabbittown Cafe for breakfast then caravan up to the launch on the Tugaloo River at Stephens County Park. We headed north for the skinny water that I had visited in previous years for these fearsome fighting Hybrids. Bringing in one of these football shaped fish was a feat all on its own because they fought like a freight train making each fight memorable. The others scouted ahead as we slowly made our way through the narrow channels. One mistake getting off course would mean we would run aground in the mud. As our other boat captains were coming back toward us from the north it was stated that there were no fish to be had. They stated that the water temperature was 50 degrees. The area we were fishing was south of the Yonah dam. Since this was a weekday we were counting on the water generation to make the Hybrids active. Water coming out of the bottom of the lake would definetly be a lot colder than the Lake Yonah’s surface temperatures. We still forged northward in the hopes that our other captains were wrong. Well being a little patient here proved to be the right approach. 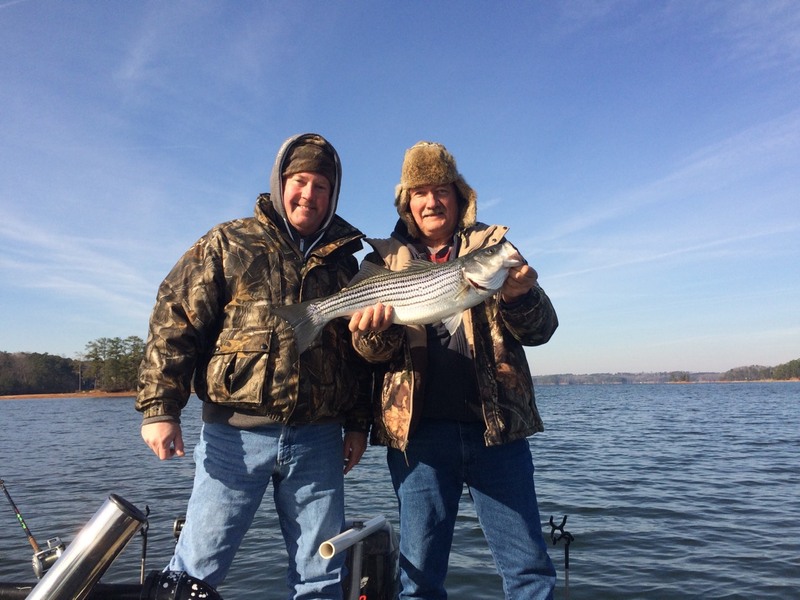 The Hybrids came one after another then Don latched onto a 10lb 29″ Striper. It was a tremendous fight with Don on the front of the boat as the Striper moved from the right side to the left crossing and tangling several rods on the back of the boat. We ended up netting this monster on the left side of the boat. This fish came on a Planer Board with a Blueback Herring 40′ behind the board. Its size was totally unexpected. We wanted to call out to the others but we either had no signal bars or no more battery to contact them. They should have hung with us instead of the “gun and run” technique they were accustomed to. The others did catch some fish. After they left us early in the day they headed southward for deeper waters. We had discovered that the pattern to catch fish today was fishing the mouths of the creeks.We fished an area of the river where two creeks entered from each side. Water temp was 50 degrees. We basically circled the area picking up a fish on each pass until the gusty wind showed up. We knew that is was time to leave as we could no longer control the boat under these gusts. This past Saturday we hit the Dog Island beaches between the three points over a 55’ bottom. The air temp was 45° with the water temperature at 51.8°. It was the outside Planer Board that got hit with the 12” Gizzard Shad and a stinger hook in the Vent. Weighing only 8 lbs this 25 ½” Striper swam toward the boat only to dive under when it got close enough to be seen. Darin had reeled in the inside Planer Board but it had already crossed the rod with the Striper that Dale was reeling in. Dale was near the front of the boat with Darin to his left. I grabbed the net and dipped it into the water trying to reach the Striper that went under the boat. There wasn’t much room to maneuver as Darin was basically pinned between Dale and myself being caught in the arm of his coat by a Mini Mack that was hanging low in the rod holder. I finally got the Striper into the boat for measurements and pictures. Earlier that morning we ran into Capt. Mack at the bait shop. We chatted a few minutes and he advised us to use his Mini Mack in the back of Shoal Creek by the boat ramp and surrounding area. We launched at East Bank Park and headed to our tip from the guide. When we arrived there was already one boat trolling with more boats coming in. We did not see any diving birds but did see a few bait balls but no Stripers to be found. We left after trolling for about an hour and headed to SC8 to pull a chartreuse/white jigged Umbrella Rig over the three humps on our way to Dog Island. As we approached the island another Striper boat followed us in and tried to hog us out by moving in front of us but eventually gave up as I held my ground so to speak. They finally left. Nothing on our first pass because we were not positioned in the right place to begin pulling bait between the points. We turned around at the far right point and went back across the pocket following the deep-shallow contour lines adjacent to our trail coming in when the outside Planer Board got hit. We thought we were on them but no other takers for the next hour or so. We left Dog Island and headed across to Sunset Cove for a look. Nothing there. We then went all the way around Lake Lanier Islands to Cocktail Cove but it too was barren of bait and Stripers. We went a little further around the main island to a multitude of reef poles near the Tiki Huts and resumed our spread of Planer Boards and Diagonal Bobbers. Water temperature was 53.5°. Again there was activity on the outside Planer Board. A 4 pound Spotted Bass took the medium Trout and Darin brought him in for pictures. Headed back to the ramp after that to get home early for a nap. Gotta rest. Going Crappie fishing tomorrow with more good friends. Hit the bait shop at 7am this morning for a couple of small Gizzard Shad, 2 dozen medium Shiners and 1 dozen Blueback Herring. Also picked up a Sebile 125 in White and a Mcstick 110. We launched at Aqualand and headed back into Flowery Branch towards the 2nd set of power lines. We continued further just to see what was past the McEver bridge. We marked several nice fish so we turned around and put out our spread of Planer Boards, Downlines and Flatlines. Water temperature was 59.9°. 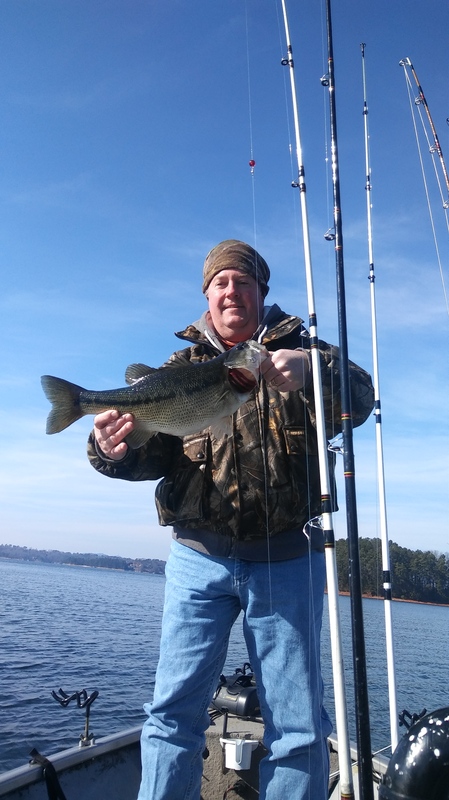 As we moved back towards the main lake pulling our baits we passed another boat doing the same thing and caught our first Spotted Bass on a Planer Board with one of the Gizzard Shad baits right in front of them. Just after passing them we marked more fish in a pocket to the right then the trolling motor konked out on us. It seemed like the day was over before it started. I called Minnkota technical support and waited a while. Then it was finally my turn. They provided a reset code which worked and we were back to fishing in no time. After catching another Spot we decided to move in the hopes of finding Stripers instead of Spots. We went to Mud Creek 4 and managed to see several Loons diving just passed the point. Water temperature here rose to 61°. We put out our same spread but added a long range Gizzie on a balloon and started getting bit but with more Spots and a couple of nice ones too. They were hitting the medium Shiners on the channel side of the boat. We picked up another 6 here. Decided to go to DBs honey hole in OC4. Caught a few more Spots and finally a small Striper allowing me to tell today’s story. We ended up with 12 fish caught on the day. Sun came out of the clouds and we were shedding our heavy layers of clothes to feel the warmth of the sun with just a cool breeze. No pictures today. Went Striper fishing and caught 11 Spots and an aquarium sized Striper. After a great day of searching for Stripers and great conversations with Gerry W. it was time to head in. We still had to manually stow the trolling motor as this was still an issue which partner would have to deal with when he got home. Thanks Gerry for a fine outing on a weekday just before Thanksgiving and have a happy one to you and the Mrs.